She died in her sleep. That incongruous fact should not be taken to mean she died peacefully or of natural causes. No, Natalie Seline’s death came at the hands of those who she had led in life: people of faith, Priests who once served the Holy Light and sought to defeat the Orcish Horde. Yet in their hunger for dark power, they chose to murder their teacher and claim her most powerful relic for themselves. And why would they not? Natalie Seline had stepped from the Light and into the Shadows many, many years before her death, and that relic her fellow Priests stole from her was Xal’atath. 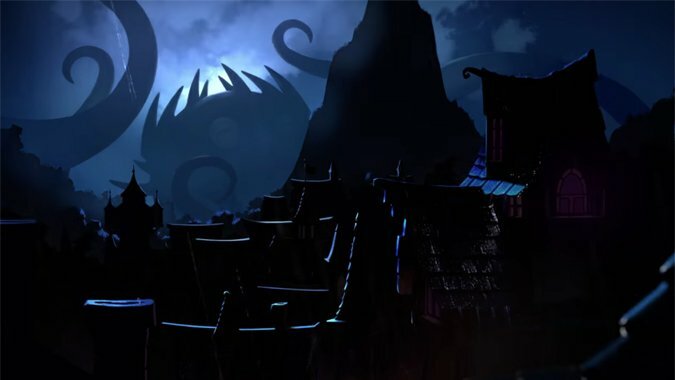 The cursed claw of darkness taught her the mysteries of the Void and the powers of Shadow, yet Seline never fully succumbed to the whispers as did many of those who followed her path. For this crime, she was struck down by her own. How did she find this Xal’atath? What drove her to wield it? How did she resist the madness of the whispering voice of the Black Empire? Before the First War, you would have been forgiven for thinking Natalie Seline a boring person. She was concerned with matters of faith and redemption, but not terribly exciting. 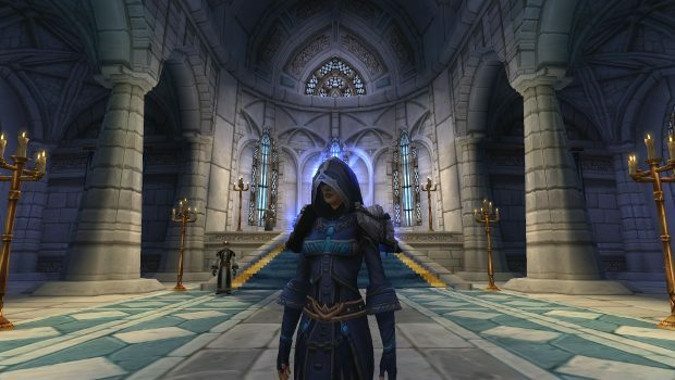 She was simply a Priestess of the Holy Light who rose to the rank of Bishop in Stormwind’s branch of the faith, traveling between Northshire Abbey and Stormwind Cathedral on her appointed rounds. Had the Orcs never come, she likely would have lived out her life, died in relative obscurity and been remembered by a statue in the Cathedral that would sit there now. But that life never happened, because the Cathedral Bishop Seline knew was razed to the ground by Orcs. The First War uprooted Natalie and those of her nation that survived. The world that followed that war — one where Stormwind had been destroyed utterly, its citizens driven into flight — left her horrified. 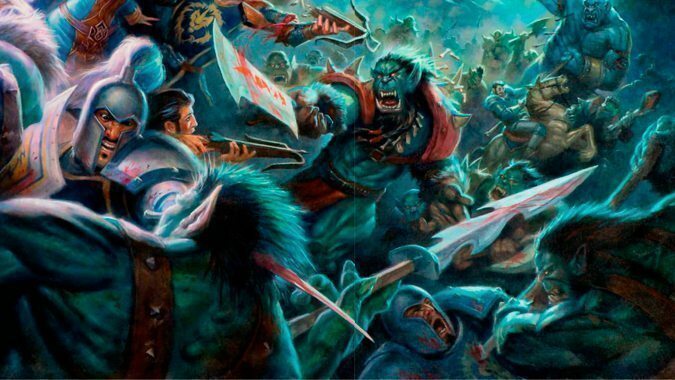 The Orc Necrolytes under Gul’dan took the bodies of deceased Knights of the Brotherhood of the Horse and defiled them by placing the spirits of slain Orcs within their bodies to create the first Death Knights. Bishop Seline could not reconcile her faith in the Light with what she saw. How could such foul magics even exist in a beneficent universe? If the Light truly was good and pure, how could it allow such madness? She vowed to learn and understand. She threw herself into research, studying every scrap of lore the Church had on the subject of dark magic. She went to the places Necrolytes had employed their arts, studying the tainted land left blasted by their blasphemous rites. And in her searching, she heard rumors of a blade unlike any other. A force of darkness that perhaps allowed the Orcs to profane the dead as they had. She decided to find this mysterious dagger, whatever the cost, and end its influence in the world. While her people fled to Lordaeron and created the Alliance, Natalie was hunting down Xal’atath. How could such a horror exist? The very existence of the Artifact terrified and offended her. While the war unfolded, she eventually found what she sought. 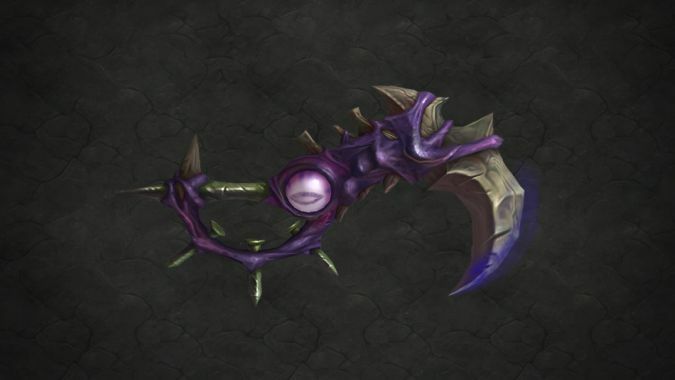 Those that know the blade’s history wonder if Natalie found the blade, or if it found her, much as it had found Mogdud during the War of the Three Hammers and found Kith’ix the C’Thraxi long before the Sundering. What we know is this: upon touching the Blade of the Black Empire, it spoke to Natalie and in that instant she realized that she could never destroy the dagger. She was far too ignorant of the power that created it and the power that infused it: she needed it to learn. Thus Natalie Seline, Bishop of the Holy Light, became something else entirely. 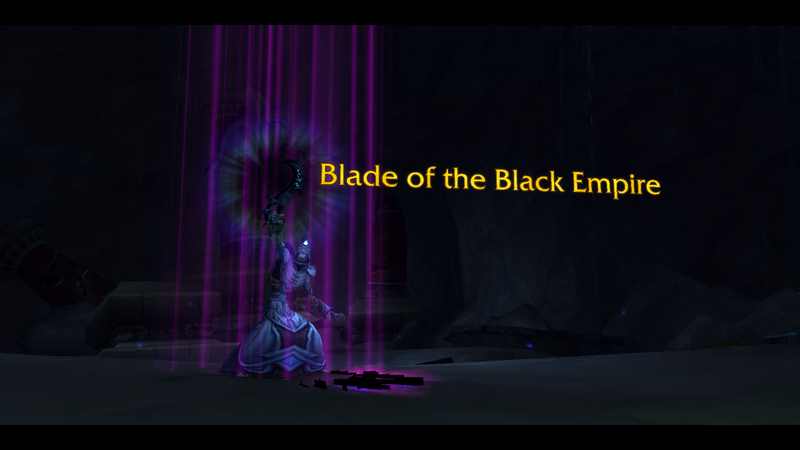 To her credit, while she held the blade and listened to its whispers, she never fully embraced the power Xal’atath promised her. Unlike Modgud before her, she did not trust the promises of the Artifact. Still, she did change. Gone was the woman whose pure faith in the Light had elevated her to the rank of Bishop: all had been replaced by a new teaching. Natalie told those that would listen to her of the balance between the forces of Light and Shadow, demonstrating the power drawn of the Void. And many listened to her. Natalie’s teachings were that existence was made of the interplay between these cosmic forces, between Light and Shadow – and that a truly powerful will could draw on both. She gathered to her side those willing to risk using such power to oppose the Horde, for her original purpose was still burning within her. She would defeat the Horde using the same shadowy power the Necrolytes had turned upon them, to wield Shadow and Light where they could only draw upon Shadow. She did not join the Alliance itself, nor did her followers, but in secret they waged a war of their own. But Natalie’s strength of will didn’t prevent Xal’atath from continuing to whisper to her of secrets long hidden, powers long lost. She grew obsessed not with the Horde, nor even Shadow magic itself, but in the question of how? How did such magic exist? How could Xal’atath have come to be, what were its origins, what were its secrets? What was the Void? After the Second War was over, these questions became obsessions. Natalie dedicated herself to their answers. While this happened, those who followed her had grown envious. Natalie had greater mastery of Shadow than they did. Yet she preached caution and balance, sequestering herself in study rather than instructing them in how to grow in mastery and power. Soon the blade itself became a point of envy. Clearly it was the source of her power and of the wisdom she scrawled in book after book. The dagger contain secrets Natalie hoarded for herself. Her followers grew dissatisfied as she grew reclusive. Balance? What good was balance between Light and Shadow when, to their minds, Shadow was the stronger? Had Natalie herself not used Xal’atath to defeat the Necrolytes? If the Light had been capable of defeating Shadow on its own, she wouldn’t have needed the blade. Natalie’s cabal soon became overzealous in their hunts against Orcs. Revenge and a hunger for power now guided them. Many had forsaken the Light and ignored Natalie’s pleas for balance and caution. While she tried to rein them in, still she mused on the Void and its true secrets. Her last work, Secrets of the Void, plumbed the depths of the Blade of the Black Empire’s vast storehouse of knowledge about the Old Gods, the Void, and the madness therein. It was a masterwork. As if the dagger had been waiting for her to finish it, it was then that Natalie’s students slew her in her sleep to steal the dagger… and were never heard from again. The mages of the Kirin Tor did not view Natalie’s new cult dispassionately. Fearing what might become if her writings spread, they seized as many as they could, combing the kingdoms of Humanity for every scrap of dark lore and every philosophical treatise she penned. Yet her teachings still spread. Her musings on the Void, her doctrine of balance between Light and Shadow would in time create a new cult in Plague-destroyed Lordaeron among the newly freed Forsaken: the Cult of the Forgotten Shadow. Today, Seline’s writings, the Secrets of the Void are wielded by the same one that holds Xal’atath, and perhaps in reading the tome that Priest can find means of controlling the dagger rather than meeting the same fate Natalie did. But it must be remembered: Natalie Seline turned to darkness to fight darkness, but she never succumbed to it, even though the whispers of the same beings broke Deathwing and so many others. Even at the moment of her death, haunted, obsessed, she died sane. And in death, she still has a part to play. For to someone who plumbed the depths of the Void, death is no longer quite so terrible… or so final.